The Speedcross 3 is one of the best running shoes for hikers currently available in the market. It is designed and created by Salomon, a sports wear and gear company started in the French Alps in 1947. The Speedcross 3 was made to provide the ultimate grip suitable for any condition. It is very light. It provides excellent cushioning and precise fit. Its founders, Francois Salomon and his son named George created and perfected the technology for the world’s first modern ski equipment. Such desire and passion in ski equipment design innovation branched out into other sports like mountain climbing and hiking. The company soon grew and designed not only ski apparel and footwear but also other mountain sports activities like mountaineering, hiking, trail running and adventure racing. Much of the designs of the company are inspired and made due to years of experience as mountaineers themselves. Salomon Speedcross 3 is the third edition of the highly esteemed Speedcross series. It was made for training and racing. It was made to endure tough weather conditions and rough trails. It boasts of an aggressive grip, precise foothold and lightweight protection. The outsole has premium wet traction contragrip while the midsole has molded EVA, injected EVA and lightweight muscle. Its sockliner is made out of OrthoLite and molded EVA. It has three unique features namely Descent Control, Sensifit and Quicklace. 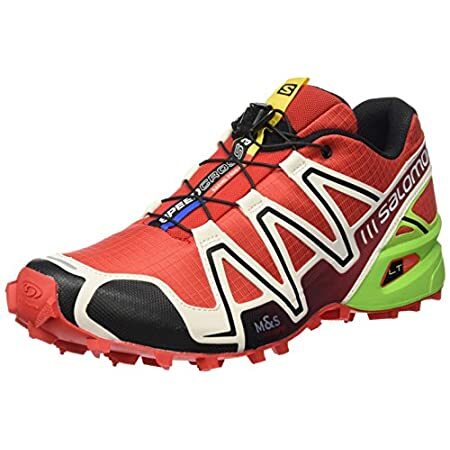 It is a technology devised by Salomon that utilizes the combination of compound, geometry and density to optimize the shoes for a particular sport and specific surface conditions. The traction used in this pair of trainers is made from gripping lugs and durable rubber. The gripping lugs help in providing traction when climbing steep slopes while the durable rubber is helpful to shield the shoes from the damaging effects of the pressures of the climb. It provides a comfortable and precise fit by cradling the foot starting from the midsole flowing to the lace eyelets. It is a lace technology that utilizes strong polyester cord which runs through the friction-free lace eyelets. As the lace is pulled, the laces will tighten evenly. A stopper is used to lock it in place. There is also a provision to stow away the cord and stopper called the lace pocket. With regard to the cushioning, Speedcross uses proprietary compressed EVA. This lightweight EVA is for gait cycle transitioning and smooth cushioning. It keeps the weight down and reduces the forces exerted on the underfoot. It has also an EVA molded OrthoLite sockliner. This sockliner is a combination of an EVA heel cup and OrthoLite foam. The foam promotes a drier, cooler and healthier environment inside the shoes. The foam is breathable enough that you can wear the trainers even without socks. The OrthoLite foam will prevent the build-up of moisture. It will prevent the growth of bacteria and fungus inside the shoes. The outsole uses Mud and Snow ContraGrip. This protects the shoes from the harsh outside environment such as debris and abrasive surfaces. It is very durable and does not peel easily. Aside from the Descent Control technology, the Mud and Snow ContraGrip also helps in providing shoe traction. The upper sole is made from Anti-Debris Mesh. This mesh is a type of fabric created to shield the interiors of Speedcross from dirt and debris. Small rocks, dusts and other objects will not enter the shoe because of this fabric. It is also water-resistant. It is beneficial when crossing wet surfaces like rivers and streams. On top of all this, the shoe is still very breathable. It comes in several colors like blue, slate blue, slate black, deep blue, black, silver metallic, green, radiant red, real green, deep red and bright blue. It is note-worthy, however, that SpeedCross 3 is more suitable to neutral runners. For men, a pair weighs 310 grams while for women, it weighs around 260 grams. For both sexes, the heel to toe drop measures 11 mm while the heel height is at 20 mm. The forefoot height measures 9 mm. The impress cushioning system gives excellent comfort. It is made for neutral runners. The quicklace system is very easy to use. It has a very snug fit. The outsole and the midsole are made from strong and durable materials. Because the shoes were made for neutral runners, individuals with overpronation and supination may need a different pair. It can be too narrow for some. It is a running trainer designed for daily use for trail hikers. It works better for those with neutral arch support. One customer said that it is not too bulky or overwhelming. Some customers gave emphasis to this because bulky and heavy shoes are a really burden when running. One user said, ‘the cushioning system is beyond excellent. I have never felt so comfortable wearing running shoes. Some also noted the Quicklace system. It allowed the runners to adjust the shoes without much hassle. It also helped create a snug fit. The type of fabric used for the upper mesh also received a lot of praise. Most noted how it prevented moisture to enter. The inner fabric is breathable. It did not create any moisture inside the shoes. They noted how this was very important to prevent the growth of molds inside. However, there were also those that noted that the upper fabric of the shoes peeled off. Another also said that the stopper of the Quicklace system of her pair broke, preventing her from locking the laces in place. She also said that it was quite hard to find replacement for the laces, so she first had to make do with regular ones. Another runner said that he felt that the shoes were too narrow for him. His feet felt constricted inside the shoes. They ached after using the shoes for a while. Amidst the few negative reviews, there was an overwhelming positive response and review for Salomon Speedcross 3. As a whole, customers rate Salomon Speedcross 3 with four (4) out of five (5) stars. Salomon Speedcross 3 is a lightweight, breathable and trusty hiking and trailing running shoes. The three features namely the Descent Control, Quicklace and Sensifit are what set the shoes apart. It is also very durable and could withstand the harshest of conditions. It is available in several colors and has sizes for both men and women. Salomon Speedcross 3 is highly recommended by the experts for every day users.